In my previous, we learned how to add recent posts in your blogger site, but we are yet discuss or learn how to display recent comments in blogger, which i promised to do in my subsequent posts. Thanks to some my blog readers, who emailed me through my contact form, about this topic to turn my attention towards it. 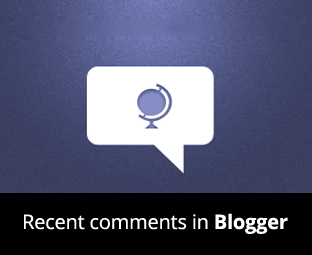 Today in this article, i will show you how to display recent comments in blogger either in your sidebar, footer or any other place you like. You might have an active community on your blog, where people often leave a comment or two on your multiple posts. However, people who leave comments on your blog are actually your followers as you don’t really see new people commenting on your blog posts unless they need help. So, this widget could help new visitors in motivating them to take part in the conversation which would certainly increase the engagement in your blog as well. How to Add Recent comments in Blogger? 1. Login into your blogger dashboard with your Google account. Note: You need to replace www.entertaintechnews.com with your Website URL, so that this widget will work just fine. To increase the number of comments shown on the widget simply search and replace “5” with the no of comments on you want to show. If you like to display dates along with comments than replace “False” with true. If you want to limit comment characters then replace “100” with any other that you like. 3. After customizing you can save the widget by pressing "Save" button present towards the end of the widget. Once done, you will be able to see recent comments on your blog. Did you found any of methods or processes above confusing, no need to worry, that’s why we have the comment box below for you. Also, please feel free to ask any questions, if any.